Awesome Friday! » Blog Archive Matt's 12 Best Movies of 2016 - Awesome Friday! Spinal Tap for the new generation. I’ve watched this movie a bunch of times this year and I laugh out loud each time I do. Better still, I find myself laughing at new and different things each time. It’s a perfect send-up of the Justin Biebers of the world, and it’s hilarious. Plus, it contains a nearly perfect pop song in “I’m So Humble”, one which should be nominated for all the awards (but probably won’t be). I really hate the idea of a “Lesser Coen” film. All the Coen Brother films are brilliant in their own ways, and anyone who tells you this one isn’t clearly didn’t watch. Sure, it’s mainly an excuse to take a stroll through film history, but it’s also a nice little character study, and features a supporting cast all giving amazing performances (I mean, just try to get through this trailer without laughing). All this plus the undisputed best visual gag of the year make Hail, Caesar! one of the years best. A boy asks a girl to be in his bands music video. She says yes. Now he needs to start a band. It’s a simple enough setup but what follows is a story of self discovery, and learning that even when things seem the most hopeless there are ways you can confront and rebel against the things in life holding you down. It’s weird to think that The Nice Guys is only Shane Black’s third directorial effort, he’s been writing so long that his signatures are easy to recognize. This one might be his best work. 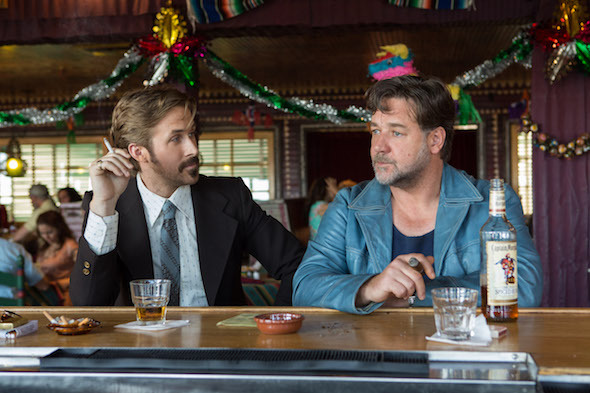 Ryan Gosling and Russell Crowe are the standout comedy duo of the year (with Gosling in particular proving to us all that his comedic timing is second to none), and the film itself is a pitch perfect homage to the buddy action comedies and noir thrillers of the past. It’s hard to know where to start with Swiss Army Man. It’s a delightfully weird movie and it’d be one that would be easy to write off as the “Daniel Radcliffe farting corpse movie” but that would not be doing it justice. Sure, it may require you to be able to buy into Paul Dano riding a dead, farting, corpse of Daniel Radcliffe across the sea like a jet ski in the opening few minutes, but once you accept that you will be treated to probably the most intimate performances of each of their careers to date, reflections on life, love, depression, and longing. I don’t want to tell you much more because you should go in as blind as possible, but definitely don’t miss it. I wish all movies for kids were this good. A simple story of a boy lost in the forest who is rescued by a dragon who also happens to be lost, and together they find themselves. It’s a story about finding your belonging and about the importance of your sense of wonder, and one where even the bad guys are sympathetic and worthy of redemption. I’m not ashamed to say I cried my way through the last act of this one. A lot of what I just said about Pete’s Dragon also applies here. Kubo is the story of a young boy searching for his own belonging, and searching for a way to overcome grief and loss. It also happens to be the most beautiful film that Laika has produced to date. If all kids movies could be as good as this one then maybe we wouldn’t need to label them kids movies. This deceptively simple story about a group of college baseball players desperately trying to get as much party time into the last weekend before the season starts is actually a thoughtful commentary on personal identity and friendship. You know how some of the best of memories between you and your best friends are from when you’re out doing simple things? This movie is like watching two hours of best friends having those moments. For most of this movie you will think it’s a pretty cold, by the number science fiction story about how we might react if aliens land. Then something happens and the film cracks wide open to reveal a beating heart full of emotion. Look, I can’t tell you more without spoiling this, but it’s one of the best films of the year. A family are exiled from the new world plantation where they’ve made their home because according to the other pilgrims they are too zealous in their religiousness. They head into the woods where the father ends up racked with Christian guilt over the fact that he’s a poor farmer, hunter, and father, and takes this out on his family. Also, there is an old school, kills-children witch in the woods they settle beside and their black goat may or may not be Satan himself. Look, if that isn’t enough to get you on board I don’t know what will be. Everyone in it is great, the cinematography uses mostly natural light to create atmosphere and tension, and Anya Taylor-Joy is a breakout star because of this movie. The story of a young man told in three parts, Moonlight follows it’s main character Chiron through three important phases in his life: a young boy, a a teenager, and a young man. In each chapter he is played by a different actor, each of whom (yes, even the kid) gives an award worthy performance. The film is a heartfelt, heartbreaking look at masculinity and what it means to be a man, and what it means to be a gay man in a society that doesn’t openly accept homosexuality. Much is being made of Mahershala Ali and Naomie Harris’s supporting performances, and suffice to say they are both fantastic, but Trevante Rhodes (who plays the adult Chiron) is the one to watch, able to convey both the confident, street tough persona that Chiron needs to put on as well as the vulnerable, nervous, loving Chiron that he actually is, and to switch between those two personas with just a shift in body language or a look. It’s a powerhouse performance in a film literally full of powerhouse performances. Moonlight is one of the two best films of 2016. You know the story, guy meets girl, song and dance ensues, followed by romance. He’s a pianist trying to save jazz, she’s an actress trying to make it in the titular La La Land. This isn’t your typical love story though. It’s bittersweet, but perfect, and I may have wept my way through the final few minutes. All at once a modern love story and a love letter to the movie musicals of old, La La Land is one of the two best movies of the year.